My family was recently watching the movie, “God’s Not Dead.” I caught the tail-end of it, but it was powerful enough to make an impression on me, and hit me with some conviction. I claim to be a Christian on this blog, but how much of that shines through? I won’t be talking about the movie, but instead, my initial reasoning for being a Christian in the sense of: I believe God is not dead. What keeps me believing I’m not alone? How do I check my faith when it falters and I begin to wonder? I look at the sky. Or watch a bird. Or go on a hike so far away from civilization I don’t see any houses. I sit somewhere high and look out. Say you’re walking through a forest and you find a yellow ball. Your first thought is that someone, a person, left it there. Not that it materialized on it’s own. How can the world, much bigger than a ball, materialize on it’s own? A youth pastor said that one night, and it stuck with me. I guess you could follow that up with the argument of “well I believe the big bang/evolution started with cosmic dust/cerebral ooze,” and I’d ask in return, where did the dust/ooze come from? Look out your window and look up. You see the sky, but do you know how far up it is? Have you seen a sky scraper? That’s not even a third of how high the sky is. It’s really amazing, and Someone made it. 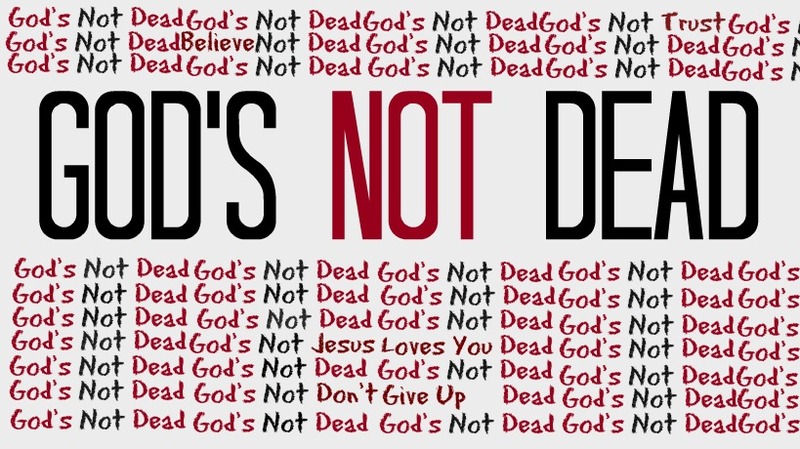 God’s not dead. He’s a master designer, keeping watch over His creation, which includes you and me. This is very thought provoking..